Esports Heaven caught up with Matt "Danog" Joyce, an up and coming broadcaster hailing from Australia. I came to know about him when ESL roped him to be a caster at ESL One Mumbai slated to begin next week. In this interview, Danog talks about his humble beginnings, his foray into broadcasting, expectations of him from this career and much more. Hey Danog. Kindly introduce yourself to our readers. Hi everyone! My name's Matt, but I go by the shoutcaster name Danog. I'm an Aussie caster for Dota 2, having enjoyed being a part of the Dota community since 2006. That's a long time to be a part of the community. How did you get introduced to Dota? It was actually through my guild in World of Warcraft at the time. One of the guys just said "Hey, let's play some Dota", and so I tagged along. I still remember my first hero. I played Brewmaster and kept running under towers because I under-estimated how much damage they'd do. I think I finished with 1 kill and 20 deaths! Nice way to start playing the game. Tell us a bit about yourself. Your life growing up, studies, etc. Growing up, I moved around a fair bit for my Dad's work. I've lived in lots of countries around the world; Australia, Canada, England, South Africa. For my studies, I have a Master's degree in genetic counselling. Why did you decide to venture into esports when you've a Master's degree in genetic counselling? I'm a very competitive person. Anything that I get into, I want to win, or I want to watch people playing and strategizing to win. Shows like Survivor, The Genius, and Society Game are my favourite. Esports fits in perfectly with this, because it combines my love of gaming with my competitive spirit. Interesting. When did you know that being a broadcaster was your calling? Which events have you cast before in the Australian scene? I've always enjoyed sharing my opinion on topics that I'm passionate about. Before getting into casting Dota, I hosted many years of Dota-related viewings (TI, DAC, and Major pubstomps in Australia). I also had a radio show talking about Australian sports, and I co-hosted the most popular Fantasy Football show in Australia for many years. In terms of events that I've cast, I've been part of the ESL ANZ Championships since its inception. This year, I've also come on board with CyberGamer / LetsPlayLive for their Dota 2 championships, and have continued my relationship casting for WESG Oceania / Asia Pacific. Throughout the years, I have also had stints with the AEF (Australian Esports Federation), and the Asian Dota 2 League, and had the opportunity to cast on the official Australian Epicenter channel for Epicenter XL. I was also part of the AMD Dota 2 Pro Series last year, which saw OG and Mineski come down to Australia to play off against the best of Australia, as well as a few promising SEA and Chinese teams. On top of this, I'm always around casting qualifiers for Minors, Majors, and everything in between. Your next stop is ESL One Mumbai. This will be your first big event with an org that is into hosting tournaments on a large scale. How were you approached for the event? Also, how does it feel? I was reached out to by a member of ESL's global team, who was impressed with my work to date. It's very important to be active on Twitter, have your DMs open, and list your best email address on your profile! With how I'm feeling, to be honest, I keep checking the Liquipedia page to make sure I'm not imagining things. It's surreal to see my name next to some of the top tier talent in the world. Haha that's wonderful. According to you, what do you bring to the table as a caster? How are you different from others? I feel like my type of analysis is based off a support mentality. It's constantly looking around the map, seeing how the 'macro' decisions can impact on the overall outcome of games. I feel like I'm pretty good at predicting drafts as well, so hopefully there will be a prediction scoreboard for the analysts at the event! Hm .. interesting. In terms of caster, where do you set your goals for the upcoming year? I'm really grateful for the opportunity that ESL has given me at ESL One Mumbai, and I want to grab onto the chance with both hands. I would love to be able to attend ESL One Birmingham as a talent as well, and I'm holding out hope that an upcoming Minor or Major will have a spot for me in the near future. I'm also looking to be a part of the returning World Cyber Games, as well as the second iterations of the PVP Esports Championships & AMD Pro Series. There may be a few hidden events on the horizon as well that haven't been announced yet. If anybody from Valve is reading this, I'll keep my schedule open for TI as well! I hope you get invited to a lot more events. Do you've anyone in esports who supported/guided you in this industry? Thanks! 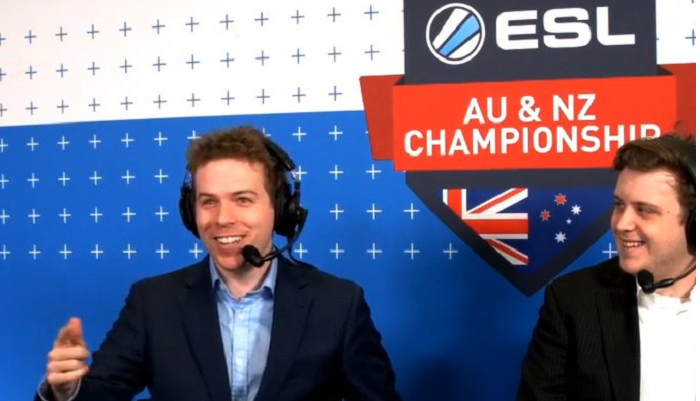 I'd like to give a shoutout and big thanks to everybody at ESL Australia who's given me guidance and support throughout my time in the broadcasting and esports scene. Also a special shoutout to my local co-casters CNC, Daredevil Dan, and Woglet, and the Dotaroo community on Facebook! If you're an Aussie / NZ Dota player, make sure you join up! Who do you think will lift the ESL One Mumbai trophy? There are lots of really close teams, so it's hard to call. If I have to pick a team then it'd be between TnC and Keen Gaming. Alright that's a wrap. Anything you'd like to say? I'd like to say thanks again to ESL for giving me this opportunity, and I hope the community enjoys what I have to offer. I'm looking forward to it! Follow Matt on Twitter here.